David strikes the perfect balance between providing a relaxed environment and delivering great training. His knowledge and approach is outstanding. He has an amazing ability to make you feel safe and trusted whilst imparting information. Highly recommended, I will definitely be continuing my bike riding training with David and would recommend people of any ability to use him. I have now done my CBTA-R, two of the Saturday ride-outs, and other essential training with David. He is an excellent instructor, knows all the good routes and is always helpful. I have learned so much from his training. Looking forward to doing my CBTA-F, some more Saturday ride-outs and of course some coffee along the way! CBTA Motorcycle pre-test training is a good idea to learn exactly what is required in the restricted or full motorcycle licence test. 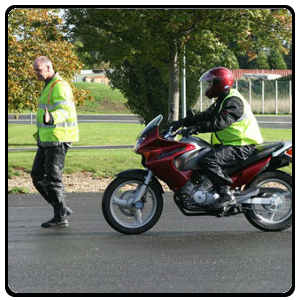 It can be a nerve breaking experience sitting your motorcycle licence test. This course will help you learn whats required, and tips on how to pass. I not only train up and coming road bike riders, I also carry out the CBTA licence tests so I can teach you exactly what you need to know – not just to pass the test, but to ride safely and confidently. Gone (well, strictly…going!…there are still a few) are the days of testing officers who had never even sat on a bike. The CBTA licensing process lets real riders instruct and assess learner and restricted riders. This gives you the advantage, as I am able to pass on knowledge of how to improve your riding and why you should ride a certain way. Sitting CBTA pre-test training is highly recommended. I’d say it is possible to pass the CBTA(R) with average riding skills, but you certainly won’t be riding at your best. The CBTA(F) is pretty strict and you really do need to be on your game. Go good reason – you’re about to buy a bigger, faster bike, and ride with a pillion if you pass – you need to be riding well before you’ll be awarded a pass to do that. So riding blind into your real test can be a risky move if you don’t know what is required, so those who sit the pre-test always have a much higher pass rate than those who don’t. If you would like to learn more about motorcycle CBTA pre-test training, please feel free to contact us via phone or text on 021 970 648 or 021 292 7364 for a chat, or use the contact form below. Questions about CBTA pre-test training? Fire a quick email to us here..
Big thank you to David for helping me fix all the bad habits I’ve picked up over the years and for teaching me extremely useful techniques, especially at low speeds. Thanks to him, passing onto the next stage of the licence was a breeze! I highly recommend anyone to get their training and licencing done through David, as he is patient and his instructions are clear, something you need when you’re going through the stress of licence tests!